Three girls in the Slavic national costume in a boat floating on the river. Girls in wreaths posing and laughing merrily. Slavic girls in embroidered shirts. 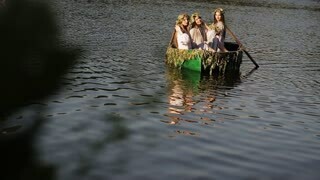 Three girls in the Slavic national dress floating in a boat on the river. Girls in wreaths fun laugh. national traditions. girls in embroidered shirts.